Background: Pain is an inevitable outcome of any periodontal surgery. Controlling postoperative pain is of utmost importance so as to increase patient compliance. The present study aims to compare the degree of postoperative analgesia with the use of oral diclofenac sodium and transdermal diclofenac patch following periodontal flap surgery in patients with chronic periodontitis. Materials and Methods: A total of 20 patients requiring full mouth flap surgery were selected for this study. Flap surgery was performed quadrant-wise and transdermal diclofenac patch was applied on the right arm following surgery of one of the quadrants and 100 mg oral diclofenac sodium twice daily was prescribed following surgery of the subsequent quadrant. The postoperative pain was recorded on visual analog scale and pain intensity scale 24 h after the surgery. Results: Both the statistical and clinical observation showed that diclofenac sodium administered transdermally has equal efficacy as compared to drug administered orally. Conclusion: The study concludes that the diclofenac administered transdermally has equal potency in relieving postoperative pain as compared to orally administered diclofenac sodium following modified flap surgery. Transdermal patch has an added advantage of better patient compliance as it does not cause gastric disturbance. The premise of successful periodontal treatment is based not only on the proper surgical technique but also on the prevention and management of postoperative complications. Pain is one of the most commonly experienced symptoms after periodontal surgery. Hence, surgeons strive for an analgesic modality that would provide profound analgesia and would be best tolerated by the patient, hence ensuring patience compliance. Nonsteroidal anti-inflammatory drugs (NSAIDs) are among the most widely used therapeutic class of analgesic compounds used to relieve postoperative pain., Diclofenac is the most extensively used for postoperative inflammatory conditions, and it affords quick relief of pain and swelling. Analgesic drugs can be administered in a variety of routes, including oral, parenteral, inhalation as well as transdermal. Oral administration has only 50% of the absorbed dose of diclofenac sodium due to the first pass metabolism. Recently, drugs can be delivered across the skin to have an effect on the tissues adjacent to the site of application or to have an effect after distribution through the circulatory system. This concept has led to the development of transdermal patches. A transdermal patch or skin patch is a medicated adhesive patch that is placed on the skin to deliver a specific dose of medication through the skin and into the bloodstream. Transdermal drug delivery system provides a means to sustain drug delivery as well as to reduce the intensity of action and thus reduce the side effects associated with its oral administration [Figure 1]. To the best of our knowledge, no study reported the clinical use of transdermal diclofenac patch following periodontal flap surgery. Hence, the aim of this study was to compare the degree of postoperative analgesia with the use of transdermal diclofenac patch and oral diclofenac sodium following periodontal flap surgery in patients with chronic periodontitis. The study was conducted in the Department of Periodontology, Rungta College of Dental Sciences and Research, Bhilai, Chhattisgarh, India from December 2014 to March 2015. A total of 20 systemically healthy patients with chronic periodontitis were selected from the outpatient department. The study group included 12 male and 8 female patients of age group 20–50 years. Patients were classified as having chronic periodontitis on the basis of the 1999 consensus classification of periodontal diseases. Inclusion criteria were patients with chronic periodontitis requiring flap operation following Phase I therapy, patients with no other systemic ailment. Patients excluded were patients with endodontically involved teeth requiring management, those allergic to NSAIDs, pregnant and lactating females and patients presenting with a history of active peptic ulcerations within the past 6 months. The ethical clearance for the study was provided by an institutionally approved Ethical Committee, and all the subjects were informed about the nature of the study and the probable side effects of the drugs being administered. A written informed consent was obtained from all the subjects. A full-mouth supra- and sub-gingival scaling and root planing procedure were performed and oral hygiene instructions were given to the patient before surgery. The periodontal evaluation was performed 4 weeks after phase I therapy to confirm the surgical need. The selected quadrants were randomly divided with the flip of a coin into Group A and Group B. 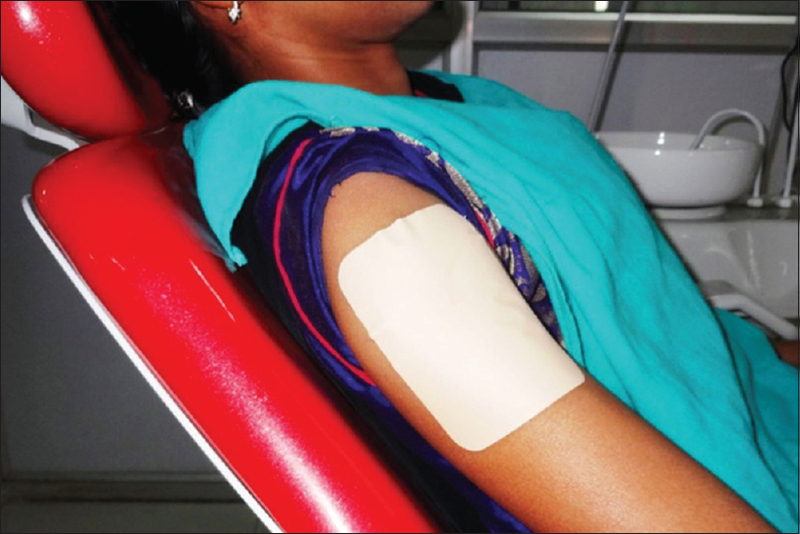 For Group A, following modified flap surgery, transdermal diclofenac patch (200 mg) Nupatch, Zudus Cadila, Ahmedabad was placed on the right arm immediately for 24 h. Modified flap surgery was performed for Group B 1 week after the first surgery and oral diclofenac sodium (100 mg) Voveran SR, Novartis, Bangalore twice a day was prescribed for 24 h. Patients were instructed to continue the same medication for the next 2 days if pain persists. All the surgical procedures were performed by a single operator. A few mL of 0.12% chlorhexidine digluconate rinse was used for intraoral antisepsis, and iodine solution was used for extraoral antisepsis. Local anesthesia was administered following which buccal and lingual sulcular incisions were made and full thickness mucoperiosteal flap reflected. Meticulous debridement and root planing were performed using ultrasonic instruments Biosonic s1 Coltene Whaledent and area-specific curettes Gracey Curettes, Hu-Friedy. Mucoperiosteal flap was repositioned and secured in place with 3–0 nonresorbable silk suture Mersilk, Johnson and Johnson, HP. For Group A, transdermal patch was placed on the right arm for 24 h [Figure 2]. Antibiotic (500 mg amoxicillin, 3 times/day for 3 days) was prescribed, and the patient was discharged with pain assessment chart. Pain was the primary variable which was assessed. Two subjective scales were employed to record the pain postoperatively. The visual analog scale (VAS) with 6 points (no pain, slight, mild, moderate, severe, horrible) and pain intensity scale (PIS) with 5 points (no pain, very mild pain, mild pain, moderate pain, severe pain) were used to assess the pain. Patients were recalled after 24 h and scores were recorded. Apart from pain, any other discomfort which a patient may encounter during 24 h postoperative period was also noted. Data were analyzed using SPSS Version 11.5 software, SPSS Inc., Chicago, USA. Power calculation was performed before the study was initiated. 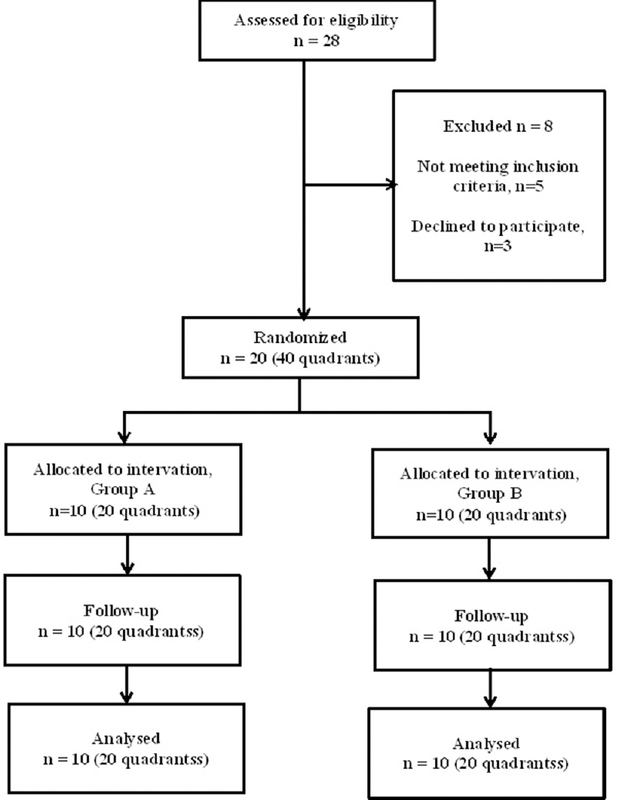 To achieve an 80% power keeping α at 0.05 and to detect a difference in parameters between groups, 18 quadrants/group were required which was rounded to 20 quadrants/group, hence 20 patients (40 quadrants) were selected for the study. Mann-Whitney U-test was employed to analyze the difference between the groups (Group A and Group B). The comparison was done between the groups for both VAS and PIS scales and value of P < 0.05 was considered to be significant. Twenty patients initially enrolled completed the study. None of the patients reported significant swelling in the operated area. Mean age of the patient was 35.05 years. Twenty-eight patients were selected for the study of which 8 were excluded from the study. 20 patients (40 quadrants) completed the study [Figure 3]. Twelve patients reported no difference for VAS and PIS scales for Group A and Group B. Two patients with transdermal patch took supportive medication. Four patients reported gastric irritation with oral diclofenac sodium. 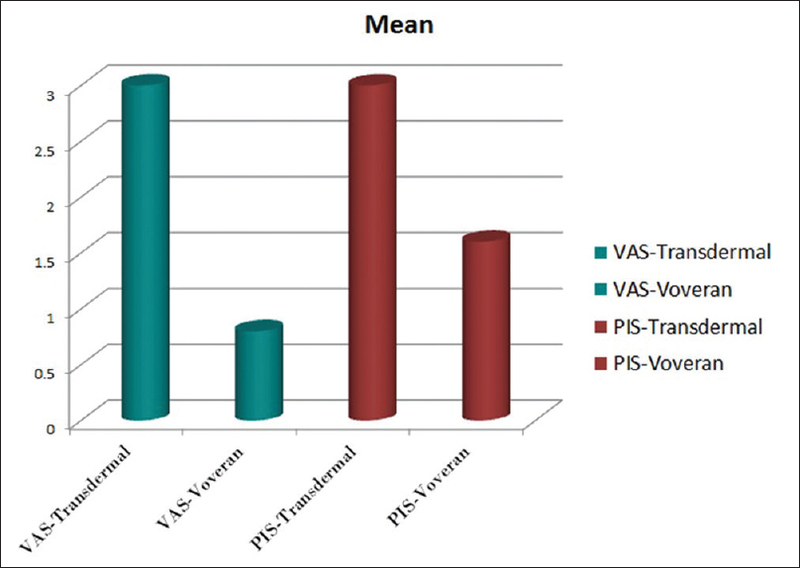 The mean values for transdermal patch group in VAS and PIS scales were 0.6 ± 0.51 and 1.2 ± 0.63, respectively. Similarly, the mean values for oral diclofenac sodium group in VAS and PIS scale were 0.8 ± 0.42 and 1.6 ± 0.8, respectively [Table 1]. There was no statistically significant difference between transdermal patch group and oral diclofenac group for both VAS and PIS scale [Figure 4]. Dealing with postoperative pain remains an arena for never ending research with better formulations and modalities continuously replacing obsolete ones. Postsurgical pain has often been a nemesis for surgeons and patients alike due to considerable degree of inflammatory response involved. NSAIDs are among the most widely used medications in the world due to their demonstrated efficacy in reducing pain and inflammation. Diclofenac sodium, an aryl acetic acid derivative, is the commonly employed NSAID either as a sole agent or in combination with other NSAIDs. It is nonselective cox inhibitor (traditional NSAID) which acts by inhibition of the proinflammatory enzyme cyclooxygenase., It can be delivered through the skin as a transdermal patch. An advantage of a transdermal drug delivery route over other types such as oral, topical, etc., is that it provides a controlled release of the medicament into the circulation. In previous studies, transdermal patches have been shown to be equally effective with an advantage over the orally administered drugs. Authors in the past have compared the efficacy of transdermal diclofenac patch with orally administered diclofenac sodium following root coverage procedure, and they concluded transdermal patch to be better in increasing patient compliance. This study is in accordance with the above-mentioned study. The transdermal route is indeed desirable, but there is one obstacle: whereas the function of the GI tract is to render ingested material suitable for absorption, the skin's function is to keep things out of the body. The major barrier within the skin is the stratum corneum which is impermeable to water and behaves as a tough, flexible membrane. However, it allows passage of certain chemical substances. These chemical substances are characterized by low molecular weight (≤500 Da), lipophilicity, and effectiveness at low dosage. Transdermal patches can be the choice of the analgesic modality of near future with its equivalent or at times better efficacy over oral doses and a better patient acceptance. The diclofenac administered transdermally has equal potency in relieving postoperative pain as compared to orally administered diclofenac sodium following periodontal flap surgery. However, long-term studies with a larger sample size along with other available analgesic modalities need to be carried out to validate this finding. Bhaskar H, Kapoor P, Ragini. Comparison of transdermal diclofenac patch with oral diclofenac as an analgesic modality following multiple premolar extractions in orthodontic patients: A cross over efficacy trial. Contemp Clin Dent 2010;1:158-63. Vaile JH, Davis P. Topical NSAIDs for musculoskeletal conditions. A review of the literature. Drugs 1998;56:783-99. Tripathi KD. Nonsteroidal anti-inflammatory drugs and anti-pyretics-analgesics. Essentials of Medical Pharmacology. 6th ed. New Delhi: Jaypee Brothers Medical Publishers (P) Ltd.; 2008. p. 184-201. Tramèr MR, Williams JE, Carroll D, Wiffen PJ, Moore RA, McQuay HJ. Comparing analgesic efficacy of non-steroidal anti-inflammatory drugs given by different routes in acute and chronic pain: A qualitative systematic review. Acta Anaesthesiol Scand 1998;42:71-9. Naesdal J, Brown K. NSAID-associated adverse effects and acid control aids to prevent them: A review of current treatment options. Drug Saf 2006;29:119-32. Chiranjib DB, Chandrika M, Jayakar B, Sampath KP. Recent advances in transdermal drug delivery system. Int J PharmTech Res 2010;2:68-77. Gannu R, Vishnu YV, Kishan V, Rao YM. Development of nitrendipine transdermal patches: In vitro and ex vivo characterization. Curr Drug Deliv 2007;4:69-76. Robinson JR, Lee HL. Controlled Drug Delivery Fundamentals and Applications. 2nd ed. New York: Marcel Dekker; 2007. p. 524-52. Aqil M, Sultana Y, Ali A. Matrix type transdermal drug delivery systems of metoprolol tartrate: In vitro characterization. Acta Pharm 2003;53:119-25. Ong CK, Lirk P, Tan CH, Seymour RA. An evidence-based update on nonsteroidal anti-inflammatory drugs. Clin Med Res 2007;5:19-34. Sharma HL, Sharma KK. Nonsteriodal anti-inflammatory agents, antirheumatic drugs and antigout drugs. Principles of Pharmacology. 1st ed. Hyderabad: Paras Medical Publisher; 2008. p. 367. Ofman JJ, MacLean CH, Straus WL, Morton SC, Berger ML, Roth EA, et al. A metaanalysis of severe upper gastrointestinal complications of nonsteroidal antiinflammatory drugs. J Rheumatol 2002;29:804-12. Hadgraft J, Lane ME. Passive transdermal drug delivery systems. Recent considerations and advances. Am J Drug Deliv 2006;4:153-60. Bachalli PS, Nandkumar H, Srinath N. A comparative study of diclofenac transdermal patch against oral diclofenac for pain control following removal of mandibular impacted third molars. J Maxillofac Oral Surg 2009;8:167-72. Sweetman SC. Martindale: The Complete Drug Reference. 34th ed. London: Pharmaceutical Press; 2005. p. 1055. Mazières B. Topical ketoprofen patch. Drugs R D 2005;6:337-44. Hampton T. Breaking barriers in transdermal drug delivery. JAMA 2005;293:2083. 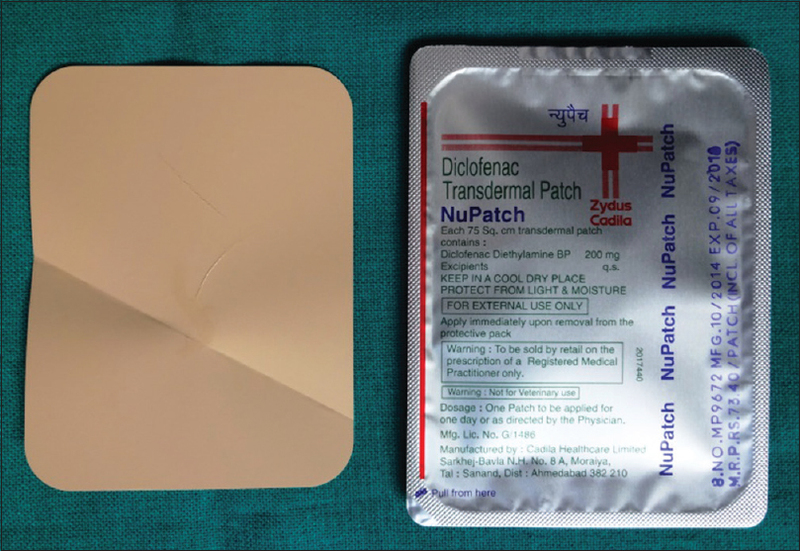 Tejaswi DV, Prabhuji ML, Khaleelahmed S. Comparative evaluation of transdermal diclofenac patch with oral diclofenac as an analgesic modality following root coverage procedures. Gen Dent 2014;62:68-71.